Boy, do we have so much to share with you. We have been shooting up a storm and really enjoying capturing photos in our Sports Fashion sessions with the local high school students. 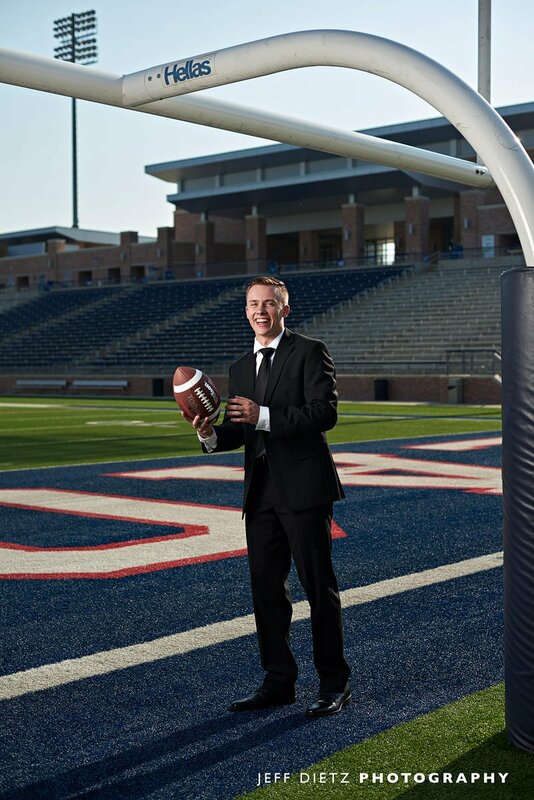 Today we show Zach’s photos who is a defensive end at Allen High School, last year’s national champions. 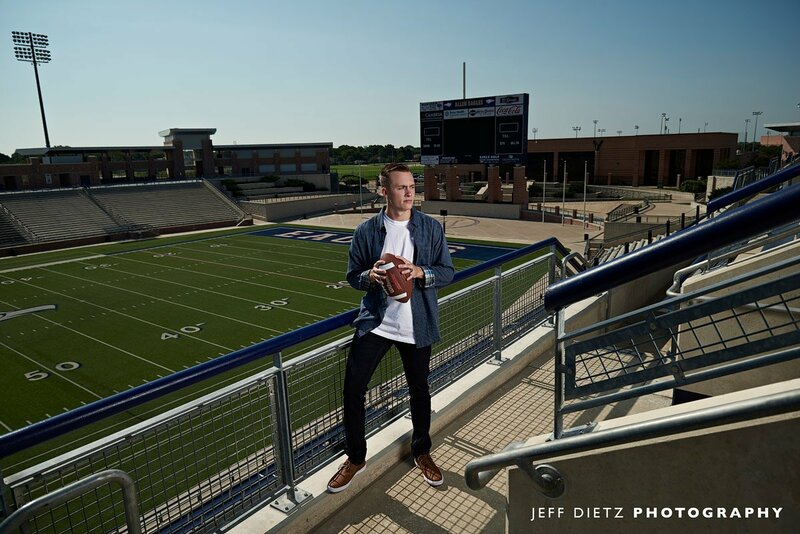 Photographing at the beautiful Eagles stadium in Allen is almost like doing a photo shoot on the turf of a pro stadium. Even in a place this grand, we still make the photos all about the senior! They say that the suit can really make the man. Zach is a fine young man and is going to go far in life regardless of this suit. But it still looks awesome, doesn’t it? I am LOVING having the students dress for success and really present a more fashion-forward, GQ look for their photos. 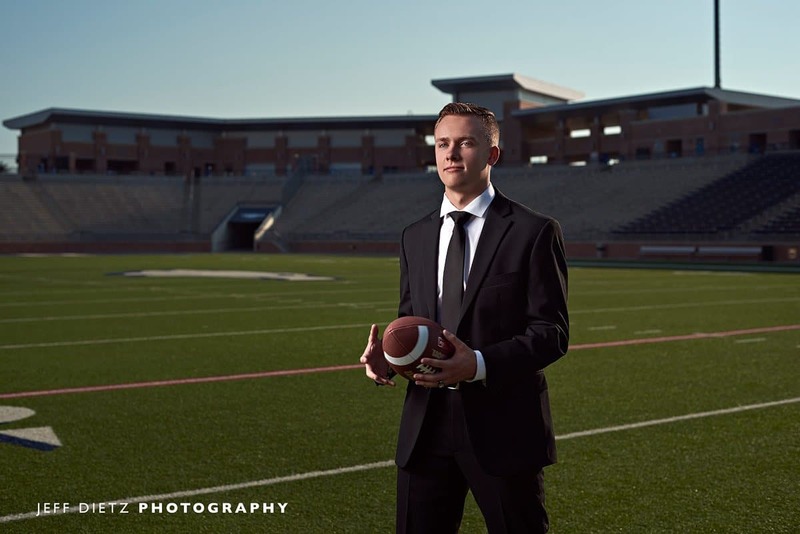 Although we can do some in their Jerseys (you will see below), for all of these sessions we focus first on the suit, and then secondly on a more casual but still very stylish outfit. I am often asked about what to do about the shirt or tie? Should you wear a colored shirt? Pattern tie? I have found that by far the sharpest look is with a white shirt that fits well, and a tie that is not distracting and fits with your suit. So in this case, he went with a bold black tie that worked perfectly. You could also add a pop of color like a red or blue that would have worked in this case as well. Let's talk about this stadium a bit? 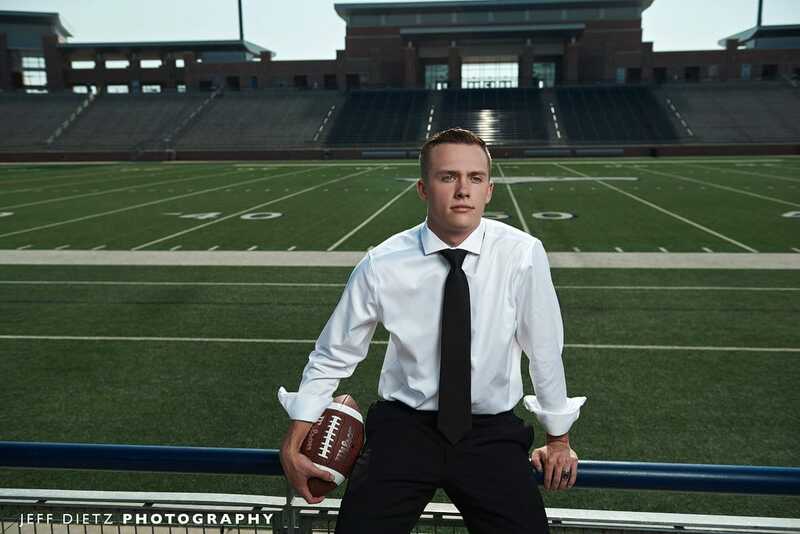 Allen Eagles stadium is impressive, to say the least. 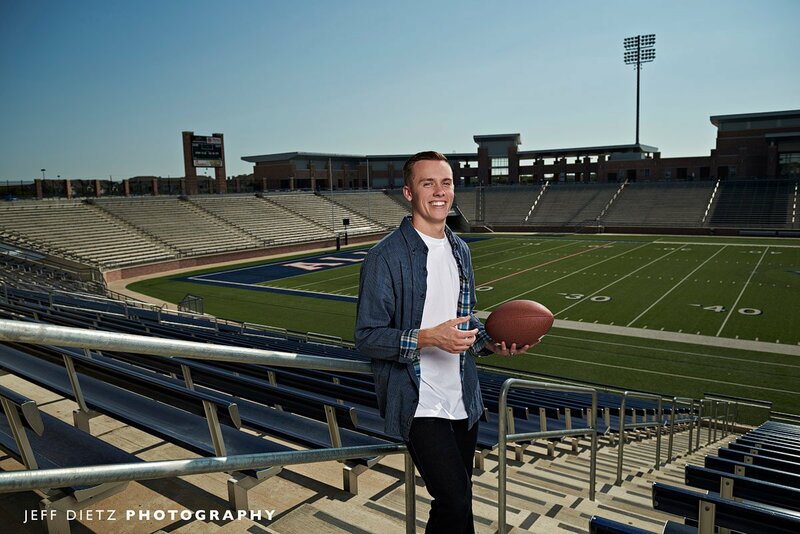 The stadium that opened in 2012 at Allen High School, cost an estimated $60 million and has a capacity of 18,000 people. You need that big of a place when you are that talented, and your band alone will be taking up 1,000 spots! A 4,000 seat student section is also impressive. Having been to several of these games last year, it’s impressive to see it full of cheering fans and the roar of the crowd. Many playoff and all-star events are also housed here. After doing a bunch of photos on the field, we hiked up the stairs and to the upper deck for some aerial shots of the stadium below. This is a great way to get a perspective of the size. What a great memory to have for these students of their time playing at such a prestigious football high school in Texas. Here, Zach is wearing one of his casual outfits that we arranged for his photos. A nice casual look for the fall season and went well with the colors of the stadium. 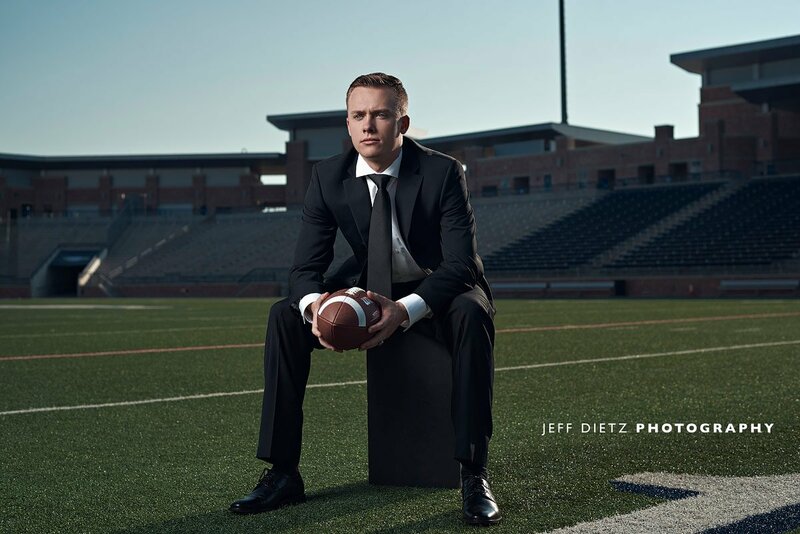 We have a bunch of additional posts to come for our Dallas Sports portraits including players from Allen and Prosper High Schools. I am also hard at work on the posts for the highlights of Bechan and Ashlynn, and some really fun posts about Italy! Please fill out this form completely, and someone from our team will reach out to you within 24 hours for an interview. Confirm that you have consulted with your parents prior to submitting this form.